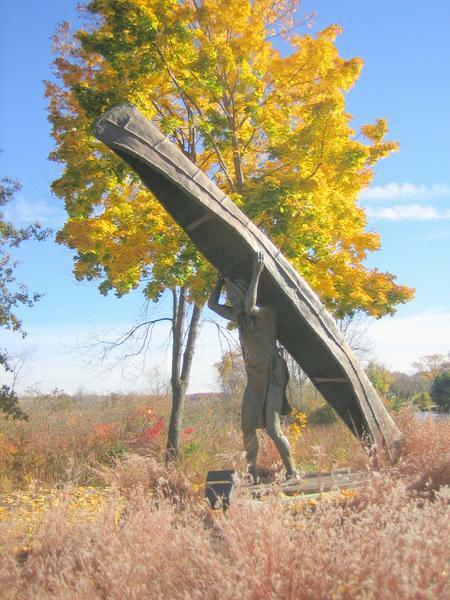 Native Americans First Walked the Portage. Chief Buffalo (Ojibwe: Ke-che-waish-ke/Gichi-weshkiinh – “Great-renewer” or Peezhickee/Bizhiki – “Buffalo”; also French, Le Boeuf) (1759?-September 7, 1855) was an Ojibwa leader born at La Pointe in the Apostle Islands group of Lake Superior, in what is now northern Wisconsin, USA. 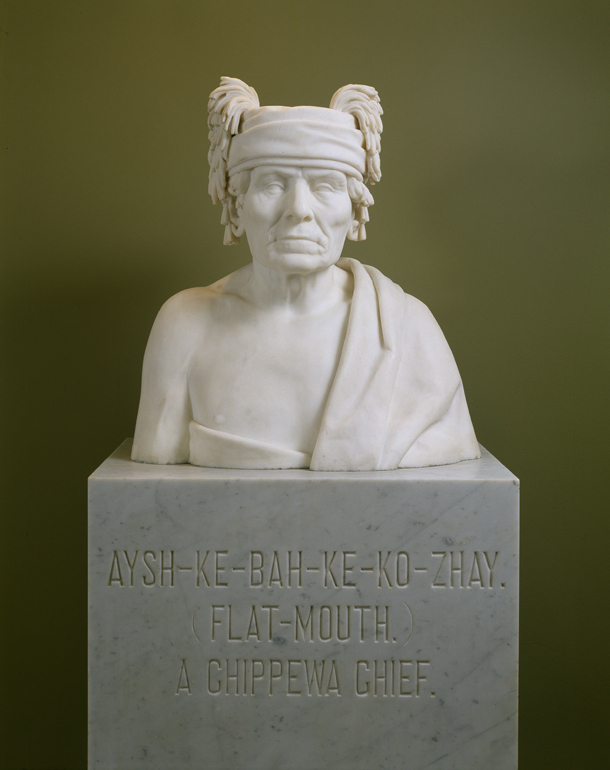 Recognized as the principal chief of the Lake Superior Chippewa (Ojibwa) for nearly a half-century until his death in 1855, he led his nation into a treaty relationship with the United States Government signing treaties in 1825, 1826, 1837, 1842, 1847, and 1854. 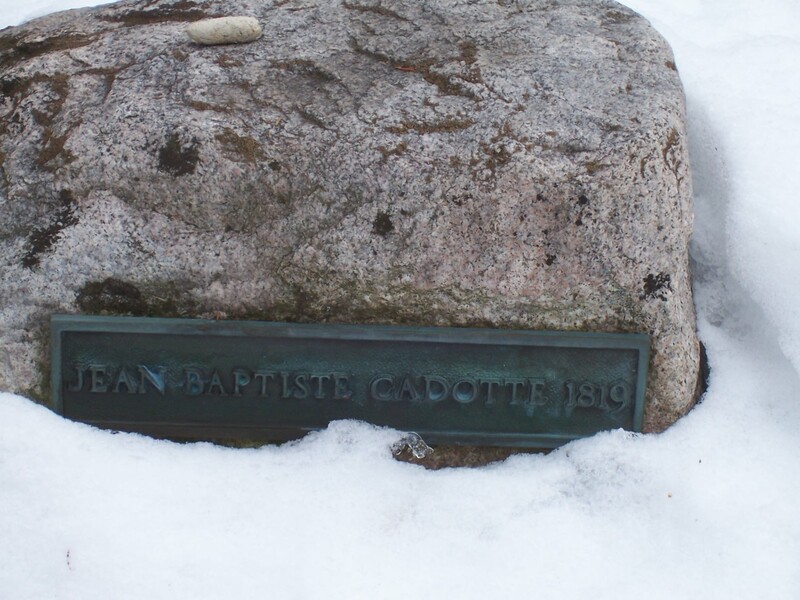 He was also instrumental in resisting the efforts of the United States to remove the Chippewa and in securing permanent reservations for his people near Lake Superior ( Wikipedia Link ). Aysh-ke-bah-ke-ko-zhay (or Aish-Ke-Vo-Go-Zhe, from Eshkibagikoonzhe, “[bird] having a leaf-green bill” in Ojibwe; also known as “Flat Mouth” (Gueule Platte), a nickname given by French fur traders) was a powerful Ojibwa chief who traveled to Washington in 1855, along with Beshekee and other Ojibwe leaders, to negotiate the cession of ten million acres (40,000 km²) including the headwaters of the Mississippi in northern Minnesota. Aysh-ke-bah-ke-ko-zhay knew who to blame for the The Sandy Lake Tragedy that killed more than 400 men women and children. See my post on this event. 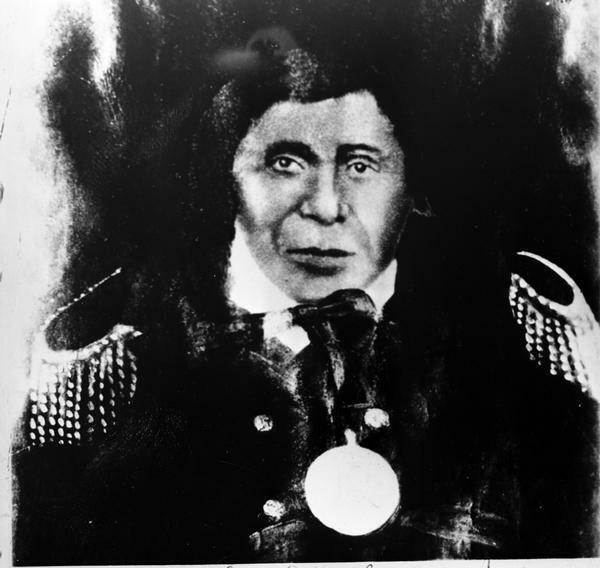 Chief Tagwagané (Ojibwe: Dagwagaane, “Two Lodges Meet”) (c. 1780-1850) – No image available – was an Anishinaabe (Ojibwa) sub-chief of the La Pointe Band of Lake Superior Chippewa, located in the Chequamegon area in the first half of the 19th century. He was of the Ajijaak-doodem (Crane Clan). His village was often located along Bay City Creek (Naadoobiikaag-ziibiwishenh: “creek for collecting water”) within the city limits of what now is Ashland, Wisconsin. The following Signators of the 1837 Treaty of St. Peters ( Treaty of 1837 Bad River Band Website ) from the St. Croix, the La Pointe, the Lac du Flambeau, the Lac Courte Oreilles, and the Snake River Bands made their way to then, St. Peters, now, Mendota located at the confluence of the Mississippi and the Minnesota rivers. Many of the delegates most likely traveled the route I’ll be taking crossing the portage at Brule/St. Croix. They may also have paddled down the Namekagon to join the St. Croix or gone overland for part of the journey to the St. Croix and on to St. Peters. Their ancestors are those who showed du Lhut the way back in 1680. This entry was posted in Brule-St.Croix portage, Lake Superior, Music and Video, Native Americans, St. Croix River and tagged Brule, Cadotte, Chippewa, Flat Mouth, Lake Superior, Madeline Island, Ojibway. Chippew. Sioux, Ojibwe, portage, Schoolcraft, St. Croix, St. Croix River. Bookmark the permalink.